It is ergonomically designed to have the right alignment of the body throughout the massage session. Massaging improves blood circulation in the body. It also happens to be a healing technique as well as a great way to de-stress the body. Most massage parlors have the massage tables where you are to lie down to get massaged. Here is a massage chair where you are to sit, not lie down, for the massage session. Stronglite ergo pro massage chair is a portable chair and an ideal companion for a pro masseur. This massage chair is made in such a way that both anterior and posterior side of the person gets a massage. There are other attractive features for this lightweight, portable massage chair. Stronglite ergo pro portable massage chair is co-designed by the Father of Contemporary Chair Massage. This is an improved version to have better comfort. This massage chair is with a sitting area, legs rest and a face/head rest. This ergo pro massage chair is made of aluminum with a semi gloss silver finish. The chair is adjustable to accommodate the client. The one-step adjustment is on the platform as well as on the other key areas like the arm support and chest pad. This allows quick and localized adjustment. The cheat pad is accommodating both the petite and larger clients. The telescoping legs help the therapist to adjust the height of the chair according to the client. This Stronglite ergo pro portable massage chair can accommodate the client height from 4”6” to 6’6”. It can carry a weight of 1200 static weight. The working weight it can carry is 600 pounds. The seat is also adjustable that allows the client to sit in the reverse position with the massage possible on the anterior side of legs, foot and torso areas. There is a hidden pouch on the chair where the client can store their valuables like glasses or jewelry. The Stronglite ergo pro-II massage chair is provided with offset nylon wheels that make easier toting from one place to another. This is a portable chair with a carrying case for the therapist to carry with him/her. Stronglite ergo pro portable massage chair is available in different color choices of Royal blue, black, burgundy, Purple Nature’s touch, and Teal color. The massage chair comes with a limited lifetime warranty. The massage chair is ready to use and comes folded. All you need to do is to unfold and start using. This would be a great asset for an individual massage therapist. The portability of the product makes it easier for them to have a maximum number of clients. Stronglite ergo pro massage chair replacement parts are also available, in case you want to replace any damaged or older pads of any part of the chair. The replacement parts are available as a standard set or as complete curve face pillow set. The complete standard face pillow pad and plate set would have the face pillow, chest pad with the wooden plate, armrest pad with its relevant wooden plate, seat pad with the wooden plate, 2 knee pads with its wooden plates and the metal brackets. The curve face pillow set would have the curve pillow with its curved headrest platform, the chest pad set, armrest set, seat pad set, and knee pad set. There is also a third set of pads only. This provides you only the padded area of the different parts with no wooden plate to go with it. You get face pillow standard or curved, chest pad, arm rest pad, seat pad and a pair of knee pads. Here also you get the color options that are available with the complete chair. The only problem is that you don’t get the individual parts. You will have to get the complete set. Kathleen has used this massage chair for 2 years now. She advises all to lock all the pads before placing the client on it. She also urges to have the client first sit, and then adjust the knees of the respective pads. The knee pads lacking the aluminum support is what bothering her most. Otherwise, she feels it is a sturdy massage chair. Ann also liked this massage chair big time. What she is critical about is the narrow neck region of the face cushion. She feels it can push into the throat that can pose problems. Another customer has used the chair for a long time. All he needed was a replacement for the pads which he feels cost him almost the same as the actual chair. He says the replacement parts should have been low priced. 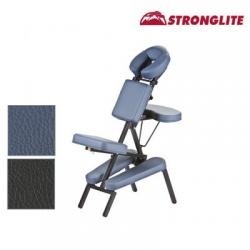 Stronglite ergo pro massage chair is available online, directly from the Stronglite website. There you can ensure that you get the warranty as well as the 30-day money back guarantee. You can also get the replacement parts for the massage chair there itself. There are other third-party dealers for this massage chair. Stores like Amazon are also offering this product, there you may find it as Stronglite ergo pro massage chair + curve headrest or simply as Stronglite ergo pro-II massage chair. While purchasing from them you need to ensure that the product comes with the warranty and all the parts. The product is shipped within the USA as well as to other countries like Canada, UK, Australia, France etc. Sipping is not free to any of the places. The international shipment would have extra shipping charges as well.